Need more information about booking Home 6518842 ? This luxury apartment is situated in the centre of the famous ski resort and spa town of St Gervais in a new development built in 2008 - Domaine de Crespin. It has been constructed to a very high specification. The location is fabulous, right in the centre of town and it is now only a 5-8 minute walk to Le bettex ski lift via a newly constructed bridge built in 2012 or if you do not want to walk, a 2 minute bus ride. It is also only a 5 minute walk to the famous Tramway de Mont Blanc - where hikers can enjoy fabulous trails in summer and mountaineers start their ascent of Mont Blanc. It has unrivalled access to the numerous other ski resorts of the Mont Blanc Massif - you can be in Les Contamines, Megeve or Praz sur Arly in 10 minutes or up in Chamonix in 20 minutes! The resort is less than 1 hour from Geneva making long weekends possible. Despite its central location, Domaine de Crespin enjoys its own private grounds set on the hill-side and commanding fabulous views but enjoying peaceful surroundings. It has all amenities within 5 minutes walk - boulangeries, cafes, restaurants, ski hire and supermarkets. 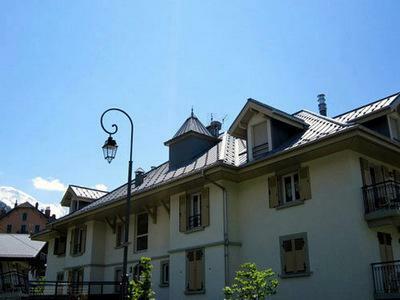 It is a second floor apartment and finished to a luxurious alpine standard. The furnishings are in the traditional alpine style, produced by local craftsmen. The basement includes a large private lockable garage for both car, bike and ski storage (which is included in the price). The apartment offers spectacular views up the valley towards the Mont Blanc Massif and, from outside, some of the best views of Dome de Miage. The kitchen is fully equipped with a conventional oven plus a separate microwave oven, four-ring halogen hob, dishwasher, extractor fan, fridge-freezer and plenty of cupboard storage full of utensils plus coffee machine, kettle and toaster. Large French windows leading to the balcony overlook the valley and ski area. The lounge has two very comfortable sofas (one converts into a sofa bed) and a large fluffy rug to stretch out on plus several coffee tables. There is a flat screen Sony TV (32 inch) which has UK satellite channels (freeview) plus a CD/ DVD. The dining area has ample seating with a large dining table with two long benches - can seat up to 10 people. Bedroom 1 and 2 have twin beds that can be pushed together to form doubles, ample storage space, clothes hooks, plus a mirror and shelf each. Bedroom 3 has full size bunk beds - this is a tiny room ideal for children, although it can sleep two adults comfortably since it has full size bunk beds. All bedrooms have chests of drawers, coat-hooks, pleasant pictures, shelving, modern lighting and controllable heaters. All bedrooms have their own doors so you can sleep noise-free from other guests or need a quick apres-ski nap! there is extra storage in the lounge for those if sleeping there to keep their clothes. There is 1 large family bathroom with a full size bath, shower, wash basin, cupboard space, heated towel rail plus a washer-dryer. There is a separate WC with a wash basin, large mirror and more storage space. The apartment also comes with a free wireless ADSL internet connection. The chalet apartment easily accommodates 6-8 people, ideal for a family/ 2 families or a group of friends. There are other apartments in the same building making larger groups possible. Linen is the only extra cost not included in the price of your holiday. Linen is £16.5 per single bed and £33 per double bed (note not per person) - this includes a full bed plus towels. We require a £400 deposit by credit card 1-4 days before arrival. Estimated price per night based on a weekly stay. Owner fees of $172.00 per stay may apply. Enter your dates to see the total cost.